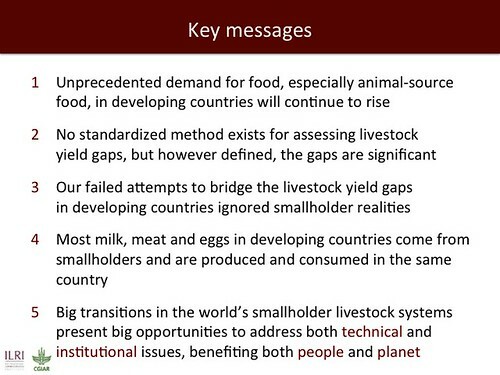 Last week, Jimmy Smith, director general of the International Livestock Research Institute (ILRI), gave a presentation on closing the big livestock yield gaps in developing countries. 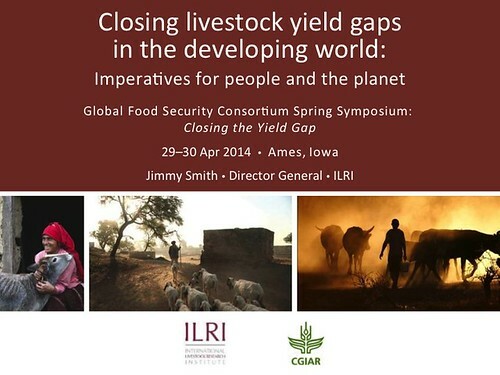 Smith made his presentation at the Global Food Security Consortium Spring Symposium, held in Ames, Iowa, 29–30 Apr 2014. Below is the gist of Smith’s talk. • We have attempted to transplant the livestock production systems of developed countries in developing countries through the importation of Holstein and other exotic high-yielding breeds to regions where they perform worse than the native animals of that region. • The animal we see, and its production, is generated by the genetic make-up of the animal (its genotype) plus the environment, plus the interactions between the genotype and the environment, with the environment here referring not only to natural resources but also to feed regimes, management practices, disease risks, ecological conditions, and so on. • What we must do is to specify the main problems in smallholder livestock feed and health and what we can do about them, particularly locally for smallholders, e.g. how to: develop feed markets, match breeds with environments, make use of new genomic technologies like TALENS and new approaches to vaccine development, produce more digestible roughages, better control diseases, determine what diseases to pay most attention to, adjudicate between need for human food and livestock feed, etc. 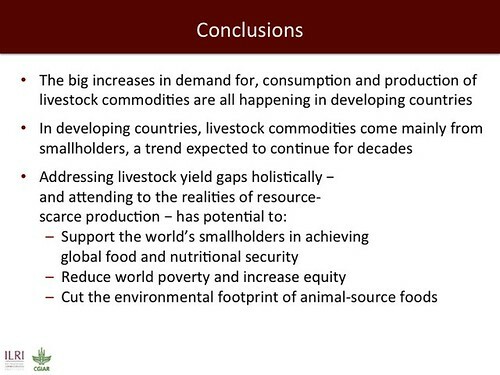 Actual yields and productivity in livestock are much lower than potential due to a myriad of challenges. This talk by Jimmy Smith is enlightening. Enjoy!